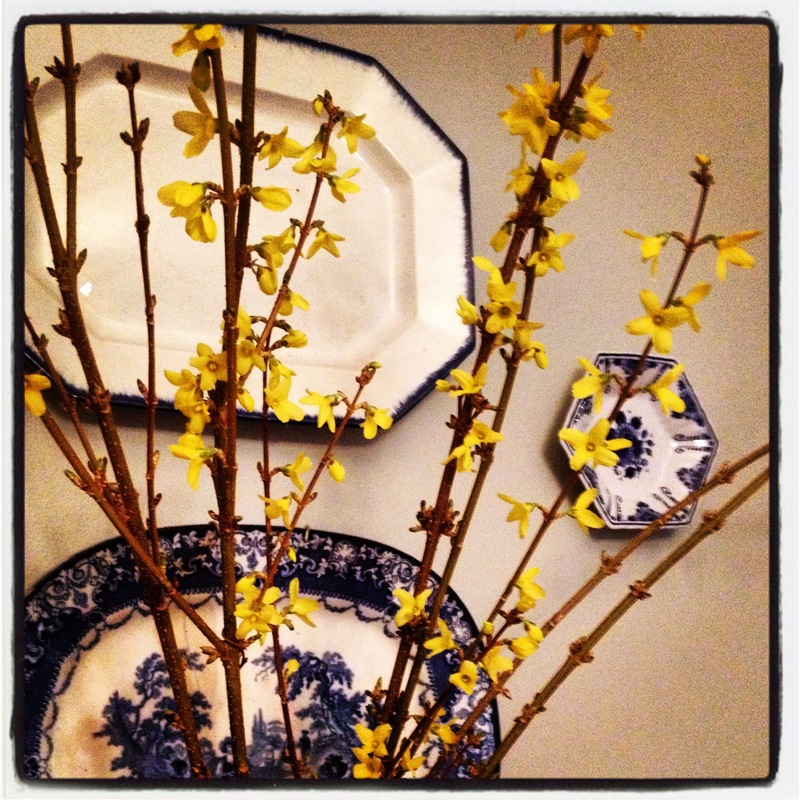 I bought some forsythia blooms yesterday. We had a giant forsythia bush on the farm up North, right off the back porch, tucked between the pantry and the lilac bush. It was the early harbinger of spring. In the cold, gray Pennsylvania winters, I looked eagerly for those first signs of awakening life to break the dreary landscape. First, I’d notice the ground getting mushy, half frozen, half thawed. I’d step off the back porch, over the little stone ditch, and my rubber boots would sink into the squishy ground, the thin brown grass under the snow just holding both soil and tread. A quick left turn, perhaps a slight slide in the mud, and the forsythia would be on my left as I rounded the corner, picking my way toward the Springhouse. The dark stand of bare branches stood silently, and I’d notice the swelling buds. Just a few more days, perhaps. Soon, a tiny burst of yellow would burst open, like popcorn, and then another, and then another, and suddenly the bush became a cloud of yellow, with a bit of green mixed in among the blossoms. The neat, square, four-pronged blossoms smiled as they gently waved in the breeze. Weeks later, among heart-shaped leaves, the luxurious mini-piles of lilac flowers would unfurl, each bloom stacked like the full skirt of a swirling ball gown, elegant, scented, lovely. By then, the forsythia blooms had melted into soft green leaves, and waited, once again, for their turn, their chance to dance in springtime winds again.